Hunter had a really long week with 3 straight days of chemo (Tuesday – Thursday), each of which we were at the hospital from 6-10 hours depending on the day. He’s been experiencing persistent double vision since last weekend, which is why he was unable to post an update this past week. Guess it’s kind of hard to type when you can’t focus on what you’re writing! This is believed to be due to one of the medications he’s been taking for the nerve pain in his amputated leg, which also seems to help keep the phantom pains to a minimum. We were able to get this switched to a similar medication yesterday, so keeping our fingers crossed his vision will clear soon and we can knock another unfortunate side effect off of the list! Have to say – I’m digging the bald head! Once we shaved it, he was back to his handsome, young self 🙂 Our youngest, Jackson, came in just as we were finished shaving and just giggled. We asked Ben what he thought of Daddy’s bald head and he said “Huh. It’ll take a few days to get used to it”. Seems he’s used to it now. It’s really nice to not have to clean up clumps of hair, and Hunter really appreciates not having clumps of hair fall into his breakfast anymore. too. This week’s round of chemo was pretty rough on Hunter. Tuesday’s treatment was fine, although an extremely long day. Wednesday morning he woke up at 5:30am completely nauseous and throwing up. He couldn’t keep any of the anti-nausea meds down, and wasn’t really starting to feel better until we were at the hospital for his chemo treatment and they could give him IV meds. Thursday he was pretty tired, but at least had a better appetite. He’s been resting most of the weekend, but seems to be starting to have a bit more energy. We’re really hoping he’ll feel well enough to join us for the festivities on Christmas Day. His parents have been here since last Sunday, and are staying until next weekend. His sister and nieces are arriving the day after Christmas, so we’re due to have a houseful pretty soon. On a totally separate note – I’m thrilled to have gotten my canvas order! We had professional photos taken just days before his amputation surgery, and I had 3 of them printed on 16 x 20 canvases. As soon as I can get him out of bed long enough, these will be hung on the wall over it. 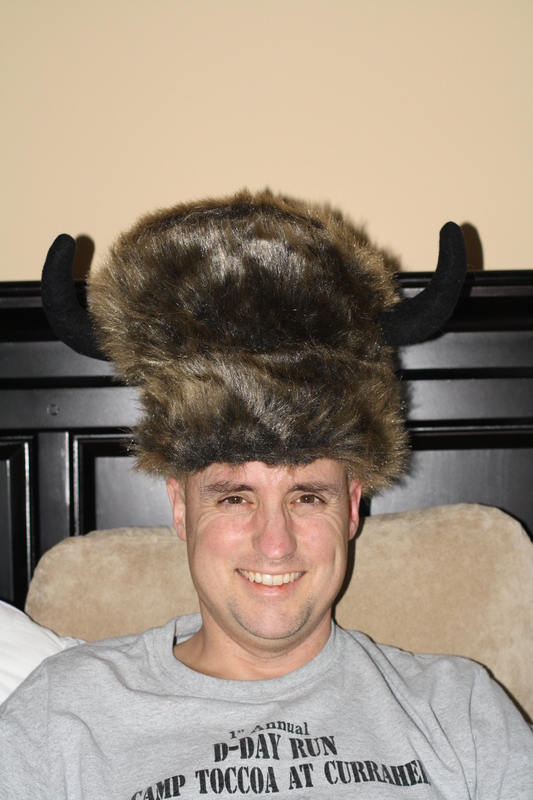 We also got a super cool hat representing Hunter’s “taking the bull by the horns” attitude from my Dad and Stepmom. I think he looks rather fetching! 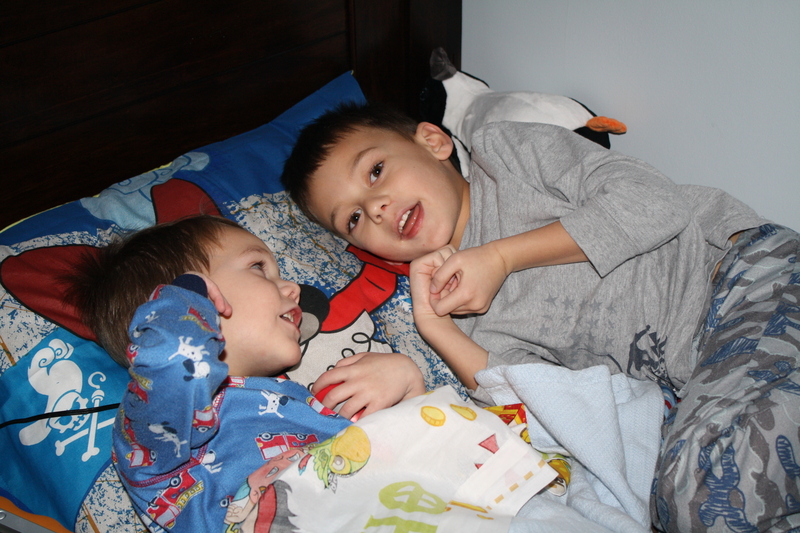 and the last – Ben helping put his little brother to bed. They like to lie down next to each other and “talk about their day”. It’s so endearing to see how close they are, and watch how they interact now. Too sweet! If you made it this far, thank you for bearing with all of my photos. Hunter hopes to posting his own updates again soon. It’s hard to believe there’s only 1 more day until Christmas! This holiday season is certainly much different for us than previous years, but we’re making the most of it. Looking forward to Christmas morning with our boys, and are really excited that Gran and Grandad get to share in their excitement, too. Ben helped me bake some cookies today so we won’t have to leave plain old store bought ones out for Santa tomorrow night (although he’s certainly not getting the yummy ones stuffed with peanut butter cups either! LOL), and we’re really looking forward to hearing the pitter-patter of little feet around 5am on Christmas morning letting us know that it’s wake up time. I’ve been excitedly anticipating the day that Hunter would join me in the elite shaved head club. Bravo. I never realized how handsome he was until now. Jenn, thanks for sharing the photos of Hunter and the boys! They are so sweet and really help me peek in at your lovely family. Looking good Hunter!! Merry Christmas to everyone in the Lindsey household!! Hope the boys don’t catch Santa by the tree! Been thinking of you guys all wk and patiently waiting for the blog. LOVE the pictures!! So sweet about the boys chatting at night – I would listen to them at night and then in the morning – they’re so adorable!! I love the huge sense of humor you all bring to this experience. Your boys (& Hunter too) look like they’re having a giant party yanking out his hair! Yikes! This reminded me of when my mother started losing her hair, immediately after starting chemo the first time she dealt with cancer. None of us could see any difference in her hair but she felt it, and was hugely annoyed by having hair drifting all over her clothes and food. It wasn’t long, but it was thick and fluffy. Rather than tolerate the annoyance, she asked my sister-in-law to cut it much shorter for her. (She didn’t go as far as asking for a shaved head, LOL. I think the whole hair thing is harder for the women than the men?) My SIL’s own mother was midway through her own by-then-hairless battle with cancer so my wonderful SIL didn’t bat an eye but got out the scissors and trimmed according to Mom’s instructions. My father got very upset, couldn’t understand why my mother wanted to chop off hair when its days were numbered, and left the room. Poor Dad, he needed a lot of TLC of his own at that point :-O You all seem to be coming at this from a stronger and funnier mindset 🙂 God bless you and your attitude! Glad you have family surrounding you for the holiday. If you need anything, yell! (quiet solitude, haha? You can lock yourself in our guest room with a glass of wine and a yoga mat? haha?) I wanna see the canvas photo at some point, I’ll bet they’re gorgeous. Many prayers for you this holiday. Enjoy! Christmas blessings to you all. I imagine that you are experiencing the depth of Christmas as never before. Beyond smiles and presents it’s telling us that God is with us (Emmanuel) through it all. Please convey my greetings to Hunter’s parents and of course to Robin, my friend and colleague, and to Torie and Lacy. What a wonderful blog. I appreciate you sharing Hunter’s progress and the pictures with all the family news. This was so inspiring, because you definitely are enjoying life among all the challenges. Give my love to all the family. I know Christmas will be eventful with the entire Bob Lindsey family together. That is a gift in itself! I hope to see pictures, when Mary Ann returns home. Merry Christmas, everyone. Thinking of all the Lindseys and many prayers heading your way. Thanks for the update Jenn. I think you may write even better than Hunter! Merry Christmas to you all. Loved the pictures! on December 25, 2012 at 3:09 am | Reply Steele & Co.
Hey JENN, So nice to get to talk with you. Wish we were there. 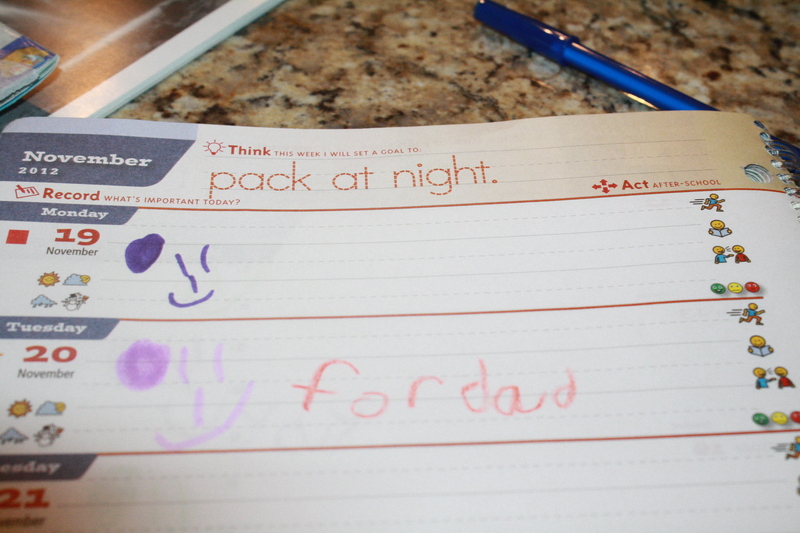 We are in spirit and will take yours to Uncle Tim’s today with us. We miss you all. Hunter,……hair is only the frame of the art. Your are beautiful w/o it. God Bless you all and keep the meditation strong. We are praying with you. Love, Steele & Co. Merrry Christmas!!!!!!! Merry Christmas, Lindsey family!!! Love the Kojak look, Hunter (are you old enough to know that reference?). Can we get your address. Also, if Hunter is having trouble typing, there is a program called Dragon where you can talk through a headset and your computer will type the words. We just got it for our two oldest they are going to let us know how well it actually works.